Arthur J. “Mike” Gerold, 89, of 503 W. Michigan Street, Port Washington died Saturday, May 8, 2004 due to complications of an aortic aneurysm at Columbia St. Mary’s Hospital-Ozaukee Campus, Mequon, Wisconsin. 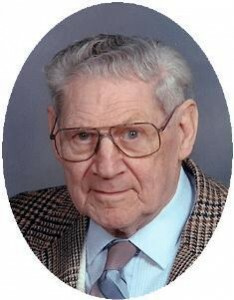 He was born on May 6, 1915 in Milwaukee, WI, son of Arthur E. and Pauline Gerold. At about the age of ten, he and his family moved to the Fredonia area. He was a member of the first graduating class from the “new Port Washington High School” in 1933. On June 15, 1938 he married Hiltrude M. “Trudy” Jentges from Port Washington at St. Mary’s Catholic Church. She preceded him in death on January 27, 1995. For many years, Mike worked with his father-in-law at Jentges’ Grocery on Franklin St. in Port Washington. He later took over the business, renaming it Gerold’s Grocery, but closed the store in the late-1950’s. He became a custodian for the Port Washington School district at Dunwuddie Elementary School and later Port Washington High School. After 23 years, he retired in May, 1980. Mike never sat idle in his retirement. He had been very active with his church as a lecter, eucharistic minister and server for holy days and funerals. He will be remembered as a kind and generous man, always there to lend a hand. He gave of himself and his talents. He loved to bake banana bread and crochet and gave all his creations away. Most recently he had been crocheting blankets, saying many prayers along the way and sharing the blankets with new parents. He earned a brown belt, studying with Fr. Sommer in his Mizu class. Mike drove for many friends who could not and enjoyed playing cards. He is survived by his daughter Mary Sue (fiance Elmer Westhoff) of Cedarburg, three sons, Gerald (Gloria) Gerold of Milwaukee, Michael (Joyce) Gerold of Austin, TX and Steven (Christine) Gerold of Sheboygan, six grandchildren, seven great-grandchildren, his brother Carl (Mary) Gerold of Sarasota, FL, sister-in-law Jane (Ralph) Ansay of Milwaukee, nieces, nephews, other relatives and friends. A Mass of Christian Burial will be celebrated at 7:30PM Wednesday, May 12, 2004 at St. Mary’s Catholic Church, 430 N. Johnson St., Port Washington. Interment will take place in the parish cemetery. Visitation will be from 4 to 7PM Wednesday at the Poole Funeral Home, 203 N. Wisconsin St., Port Washington with a 4PM rosary. Memorials to St. Mary’s parish appreciated.